Through our school-wide community service program, Annie Wright students learn that they all have talents and the ability to impact a community and develop the passion to serve. Our program focuses on service learning, with the objective of helping students develop from volunteers into service leaders. Service learning offers the opportunity for students to get involved with their communities in a meaningful way by integrating service projects with classroom learning. Every project is student-centered and based on a set process and framework. During this phase our students use critical thinking skills to identify and analyze specific community needs. A great example is when our Upper School service club, Annie’s Angels, went to Mary Bridge Children’s Hospital to learn about Tree House, a housing complex for families who live out of the area and need a place to stay to be close to their hospitalized children. The students investigated what Tree House is doing for the community and what they need for the day-to-day running of their facility, and decided that we could help by donating toiletry products for families’ rooms. Partnering with our House Cup competition program, we made this an all-school effort to collect needed supplies. The students worked together to organize the timeline, create presentations and coordinate with Tree House staff. 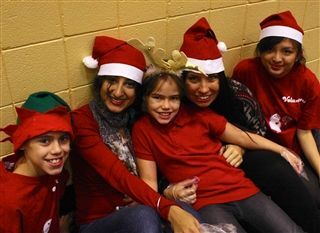 Annie’s Angels also formed groups of students to serve meals and lead themed actives for the families staying there. Students in the Upper School are also selected to serve on Mary Bridge Children’s Hospital Youth Board each year. Once students have been guided through the investigation and research phase, they begin preparing to address the need. 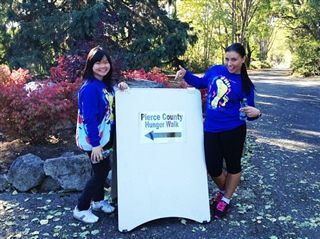 During the community service elective, students in Grades 6-8 have been preparing to participate in the backpack project, an effort to address hunger in Pierce County, already underway in Grades 1-5. To prepare, the students had to design and create boxes to collect the food, create a chapel presentation, plan a schedule around other school commitments, and work on ways to educate the general school population on the issue of hunger in our area. The students were, and often are, surprised at the length of this process. In their preparations they became a stronger, more confident team. Annie Wright has more than 20 community partners and works on a wide range of community issues each year. One partnership that typifies how we combine learning and service is our work with The Boys and Girls Club. Students identify an individual or team talent that can benefit the children at the club. The students then propose a club they will run weekly for two trimesters. They work to promote their club and get students to join. Over the last five years, our students have painted a community mural with the kids and have taught Chinese, Art, Music, Math, Cultural Awareness, Self Defense, Origami, Magic and Creative Writing. They have also tutored many students, addressing individual needs. Through this process the students discover a great deal about themselves and how they can really impact a child’s education. Students lead and participate in discussions that allow them to assess their accomplishments, to examine the impact of their work and to consider how they could improve their action plan for future projects. 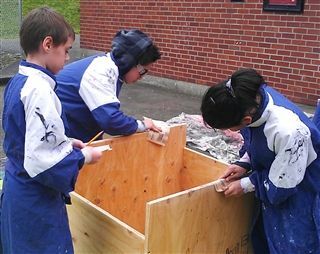 Developing reflective thinkers is a crucial part of our service-learning program. Students learn to set measurable and manageable goals and then evaluate and reflect on them. The project culminates with students celebrating their success and educating their peers on what they have learned, as well as presenting their recommendations for future projects.